Philip Whalen's previously unpublished story INVISIBLE IDYLLS, A Romantic Extravagance, for John Seaver. Written in 1962-1968. Joanne Kyger says: "Coming up for air, one finds the invisible idols being chaotically served in the hubble bubble of Chinese take-out. And totally enjoying what they are doing. And thinking and imagining what they please. Probably in Sanskrit. After performing the Toltec Pas de deux.... At this point one should read the whole thing over again. Just to be sure it all really happened." Cover design by Teresa Carrion. Front and back cover art by Philip Whalen. Paperback. 6 x 9. 34pp. 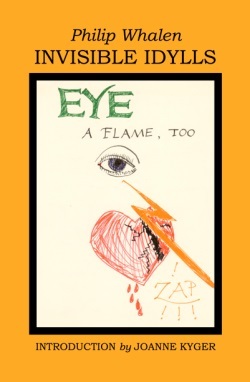 Order from Big Bridge Press, Box 870, Guerneville, CA 94044. $15.00, includes postage in the USA. Big Bridge Press announces publication of Philip Whalen's GOOFBOOK for Jack Kerouac. Written in 1961. 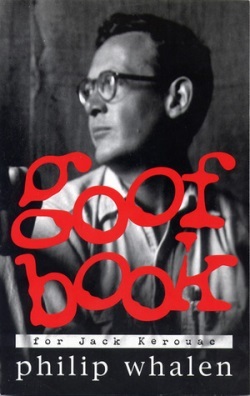 Whalen says GOOFBOOK is: "A book for Jack, saying whatever I want to say...". Cover photo: Philip Whalen and Jack Kerouac by Walter Lehrman. Order from: Big Bridge Press, Box 870, Guerneville, CA 94044.